The study also found that Americans who are more engaged in their communities are also more engaged at their libraries. But what was surprising, according to the researchers, is that the most highly engaged library users tended to be the biggest technology users. There are people who have never visited a library who still value libraries’ roles in their communities — and even in their own lives: Members of the group identified as “Distant Admirers” have never personally used a library, but nevertheless tend to have strongly positive opinions about how valuable libraries are to communities — particularly for libraries’ role in encouraging literacy and for providing resources that might otherwise be hard to obtain. Many Distant Admirers say that someone else in their household does use the library, and therefore may use library resources indirectly. Most Americans do not feel overwhelmed by information today, and the people who feel “information overload” the most are actually less likely to use newer technologies — and less likely to use libraries: Some 18 percent of Americans say they feel overloaded by information — a drop in those feeling this way from 27 percent who said information overload was a problem to them in 2006. Those who feel overloaded are actually less likely to use the Internet or smartphones and are most represented in groups with lower levels of library engagement. 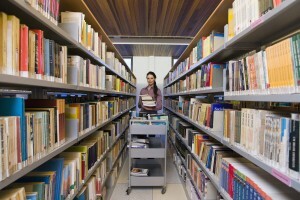 Pew Research spent three years studying the role of public libraries and surveyed 6,224 Americans ages 16 and older. The report is different from other Pew reports on libraries in both the number of people surveyed and the way respondents were sorted into groups based on their engagement with public libraries. The Pew Research Center hopes the study will spark discussions about what the future of public libraries should look like. View the full report at the Pew Research Center website.